Buildings That Wheeze, Squeeze And Dance : Krulwich Wonders... Not too long ago, bodies were sculptors' territory. Big buildings stayed rigid, classic, geometric. But now, all over the world, buildings are getting fleshy and round, more like us. The pharoahs wouldn't, and probably couldn't, do it. Same for the Greeks. Ditto the Chinese. Two, three thousand years ago, builders had trouble building curvy buildings. They did straight lines. Obelisks go straight up. The Parthenon is a rectangle-triangle combination. The Great Wall is a vertical. Of course, there were tepees and igloos, but they weren't permanent. Big buildings stayed rigid, classic, geometric. But no more. 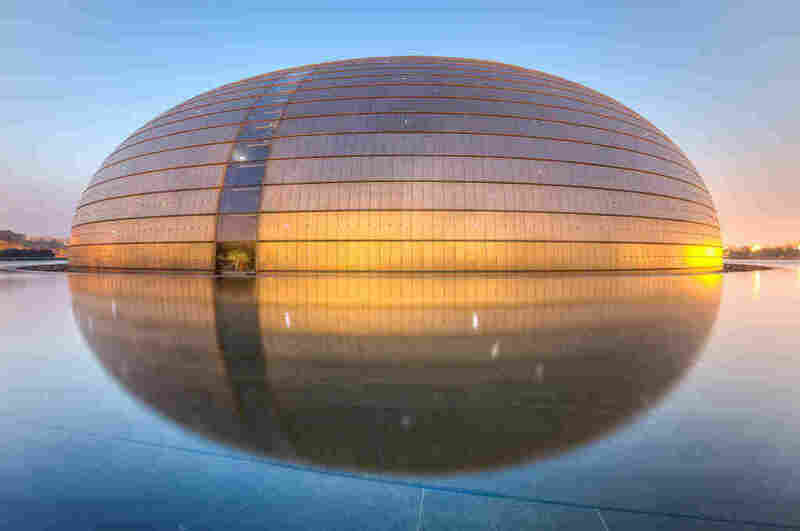 All over the world, buildings are now getting fleshy and round, more like us. Take for example, this office building on a street corner in Prague. It looks like a guy giving his girlfriend a squeeze. 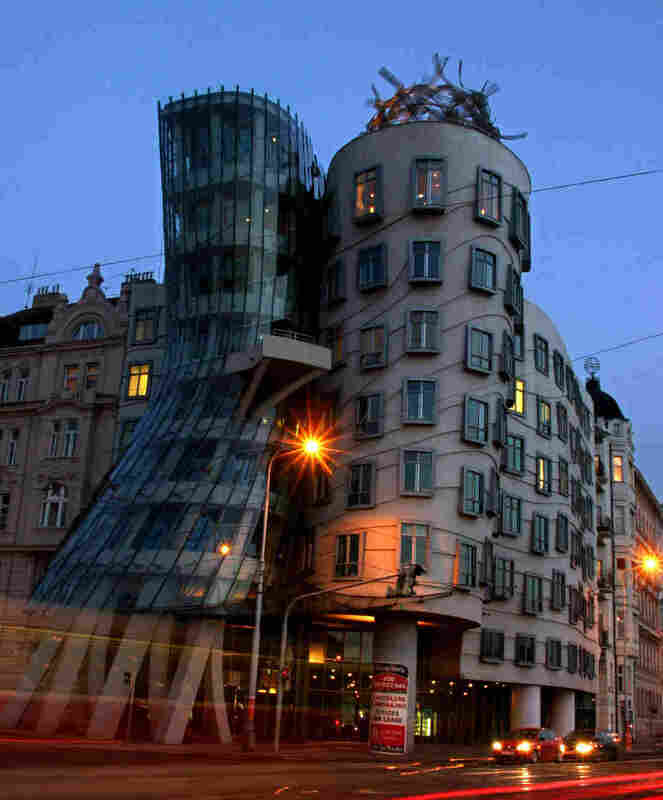 Frank Gehry, who co-designed it with Vlado Milunić, dubbed it his "Fred and Ginger" building, after the dance team of Fred Astaire and Ginger Rogers. Viewed from the right angle, the building could whisk off its corner and dance up the Vltava River. Or, imagine wandering along Monte Cassino Street in Sopot, Poland (I know, I know, you imagine this all the time), and you bump into this: the Krzywy Domek, a local shopping center built in 2004 that looks like a child's drawing that got squished. (Or, as some Poles have said, it seems to be melting.) Bugs Bunny could move in here with Elmer Fudd and live happily ever after. Then there's this building, whose sensuous curves remind me of a beautiful woman, the kind that strides off, unaware she's being oggled. 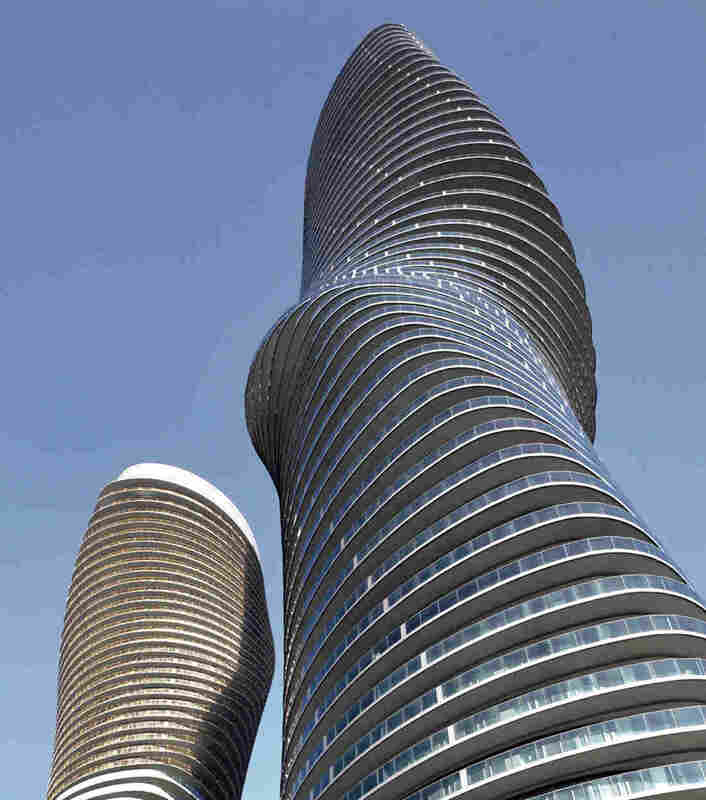 Locals call this residential tower in Mississauga, Canada, the "Marilyn Monroe," and she (can I call a building "she"?) seems like she's strutting off somewhere, leaving us behind — unless we're lucky enough to have an apartment there. ... while this next one is a sculpture you can spend the night in. It's a hotel in Hebei, China, built in 2000-2001. 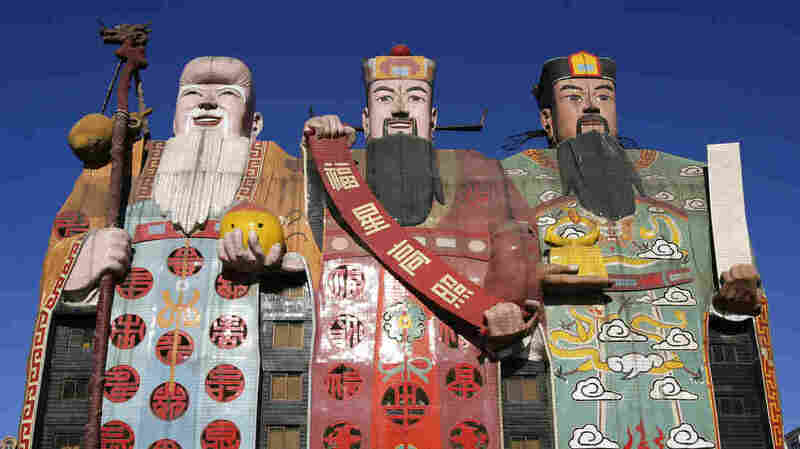 It's a depiction of Fu Lu Shou, deities that bring good fortune, prosperity and longevity. The design, I admit, is a little heavy-handed (not at all curvy), but beneath those hands and sleeves, there are hotel windows, 10 floors of them. For a little while, this place was Guinness Word Record Champion for being "the world's biggest image building." And not only do buildings turn into sculpture, here's a sculpture that has morphed into a building. 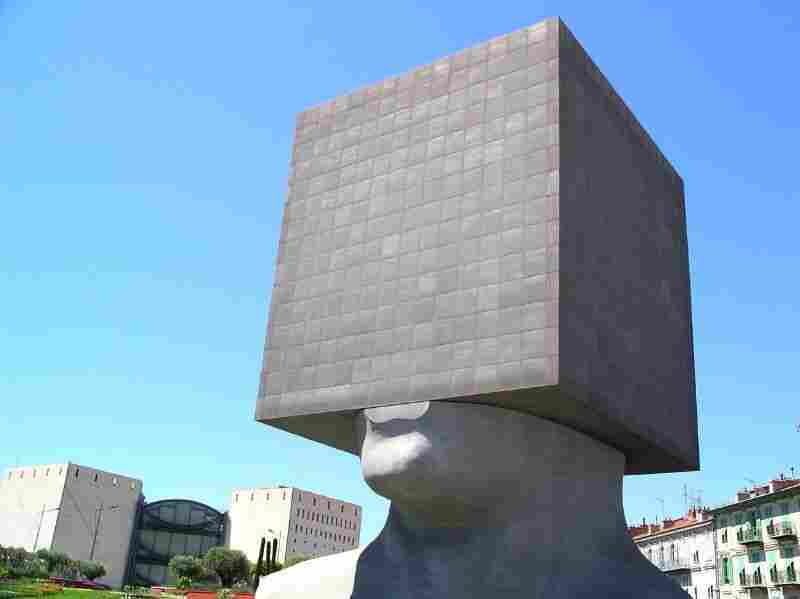 La Tete-au-Carre (also known as "square head") is the work of French artist and sculptor Sacha Sosno, who built it (with help from architects) for the Central Library of Nice. Inside that guy's skull are three library floors housing digital, paper/print media and books. It is made entirely of aluminum. Basically, he's got a building in his head. Which is a nice metaphor for architecture these days. More and more, if you're sitting at the draft table and there's a building in your head, even if it billows, twirls, or wants to waltz down the street, you don't sigh and think "can't." More and more, you turn to your engineers, look at the drawing, and say, "Let's." While researching this piece I ran into a few buildings that didn't fit my thesis, but I think you should see them. They are so surprising. One of them, the Longaberger Basket Building in Newark, Ohio, is shaped like a lunch basket, literally. (And inside it is the headquarters of a lunch basket manufacturing company, so it's baskets outside/baskets inside). Then there was a building in Houston that the city condemned, but some artists turned it into a sculpture: a representation of what would happen if a wormhole on the other side of the universe opened and latched on to a single dwelling on a Houston street. What you see is a real building being penetrated by an invisible and irresistible force. The building, I should say, is no longer there. It has gone to the other side. But you can see it being sucked on its way in this photo.